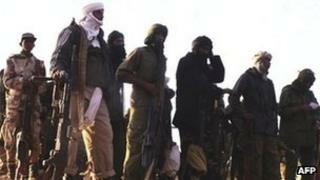 Mali's Tuareg separatist rebels have declared an end to military operations, a statement on their website says. The Azawad National Liberation Movement (MNLA) say they have captured enough territory to form their own state. But the position of Islamist insurgents, who fought alongside the Tuareg in northern Mali, is unclear. West African military leaders are meeting to draft plans for a possible intervention to force Mali's junta from power and halt the rebels. But France's Foreign Minister Alain Juppe called for negotiations with the rebels, saying there could be no military solution, the AFP news agency reports. Meanwhile the Algerian government says seven of its staff have been kidnapped by unknown gunmen in the northern city of Gao, which is in rebel hands. The consul and six colleagues were forced to leave their diplomatic mission at gunpoint. The Algerian government says it is doing all it can to find them. Mali's junta seized power last month, saying that the civilian government had been too soft on the rebels. But the MNLA and the Islamist group Ansar Dine took advantage of the military being distracted to take control of the whole of northern Mali, including the historic city of Timbuktu. In another development, a political convention the junta had called for Thursday to discuss restoring civilian rule has been cancelled after political parties refused to take part. On Wednesday, the UN Security Council called for an end to the fighting in Mali - a request heeded by the MNLA. "After the complete liberation of the Azawad territory and given the strong request by the international community", the MNLA "decides unilaterally to declare the end of military operations from midnight Thursday", a statement on the group's website says. In New York, the Security Council said it "strongly condemns the continued attacks, looting and seizure of territory carried out by rebel groups in the north of Mali and demands an immediate cessation of hostilities". Journalist Martin Vogl in Bamako says the situation in the northern town of Gao is particularly tense - and people are continuing to flee the north. Buses to the capital are packed and people are desperate to get out, even jumping onto the backs of transport trucks, he says. The UN also voiced alarm at the presence of Ansar Dine, which has links to al-Qaeda and wants to impose Islamic law, or Sharia, across the whole of the West African state. Unlike the MNLA, Ansar Dine is not in favour of an independent northern state. The MNLA was formed last year, partly by well armed Tuareg fighters returning from Libya, where they had backed former leader Muammar Gaddafi. The UN also backed the efforts of the Economic Community of West African States (Ecowas) to restore order in Mali. Mali's borders have been closed to trade, the country's access to funds at the central bank for the region's common currency frozen and travel bans slapped on coup leaders and their supporters. How is it that today our country is finding itself before the international community needing its help? West Africa's senior military officials are meeting in the main city of Ivory Coast, Abidjan, about plans to send a 2,000-strong force to Mali. Ivory Coast's acting Defence Minister Paul Koffi Koffi told the assembled generals they were supposed to draw up a plan of action, including details of how many soldiers would be needed, a calendar and budget for possible intervention "to secure the return to constitutional order and also to stop the advance of the rebellion". Former colonial power France said earlier it would not intervene but it could provide logistical support, if any Ecowas operation gained international approval. Junta head Capt Amadou Sanogo has said the army is not leaving power, but has promised to consult local political forces to set up a transition body "with the aim of organising peaceful, free, open and democratic elections in which we will not take part". Thursday's conference has been postponed "in order to better organise", said Col Moussa Coulibaly, an adviser to the coup leader. A new date has not been set - and correspondents say the coup leader had no choice but to call off the meeting because political parties and civil society groups had rejected the invitation to the event, saying they do not recognise the junta's legitimacy. Speaking after the UN Security Council passed its statement, Malian envoy Oumar Daou said his country was in an unprecedented crisis. Media captionTimbuktu mayor Halle Cisse: "We don't know who's in charge"
"People are divided, our country is threatened with partition, northern Mali is today occupied by Tuareg rebels and Salafists [Islamist militants], hundreds of thousands of refugees and IDPs [internally displaced persons] are currently living in unimaginable conditions," he said. "How is it that a country just weeks ago that was known and recognised as a benchmark, a country in which the democratic model had taken route... is finding itself before the international community needing its help?" he asked. The coup and Tuareg rebellion have exacerbated a humanitarian crisis in Mali and some neighbouring countries, with aid agencies warning that 13 million people need food aid following a drought in the region. The International Committee of the Red Cross says it is attempting to open a dialogue with the rebels so that it can recommence its aid operations in remote parts of the north. It said it had had to withdraw its international staff after its warehouses were looted in the northern town of Gao, which has been seized by the rebels. Who, What, Why: Why do we know Timbuktu?